We ate breakfast in the Carvery in the Thistle hotel, checked out and took at taxi to Victoria Station. A nice man helped us figure out which train to take to Canterbury. We missed the 9:05 by a minute. We caught the next train, and had to change trains at Faversham. 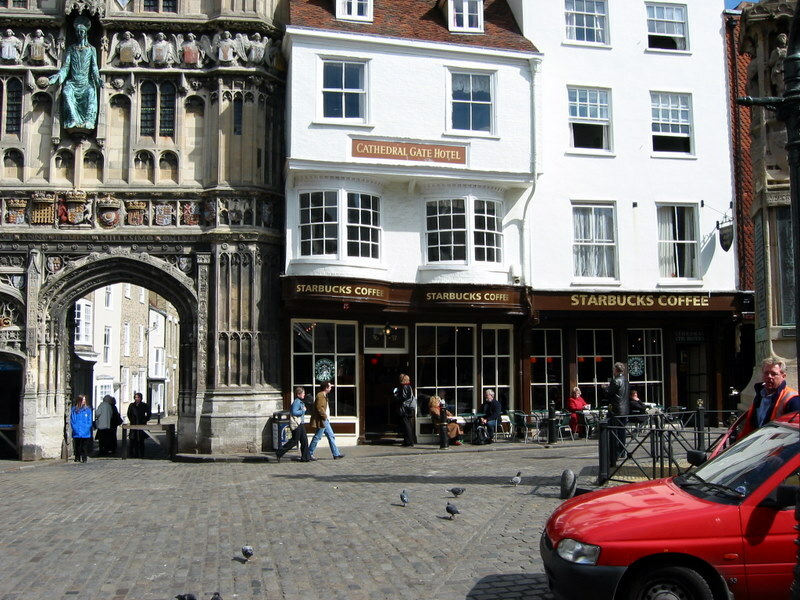 We arrived in Canterbury and took a taxi to the hotel. le. We were right opposite the Bell Harry Bell Tower of the Cathedral. We were so close to the cathedral we couldn’t capture the entire view. The tower was well lit at night and we could lie in our beds and see the breathtaking view. The pulpit at the Washington Cathedral is made from stone that was left over after the tower was remodeled in the early 1900s. I would lay there and wonder just where that stone had been. It was a nice day. There were several groups of students in the square outside our hotel waiting to take a tour of the cathedral. We found a little cafeteria in the basement of a building across from the cathedral gate. We were served rather than self service. We love to tell the story about the young man serving us, who asked us if we wanted “pies” with our meal. We couldn’t understand what he was saying so he took the top off the serving pan and there were “peas”. As a fond remembrance of this experience, we most always call peas “pies” when we serve them for dinner. After lunch we shopped around waiting for our appointment time at the cathedral. some of the history as she led us to the office of the person in charge of the vestments (vestiturer). He had an office in what was known as the ‘candle room”. There was a small window that looked down on a chapel in the crypt below. He told us that this was the room where the monks stayed to watch the body of the murdered Thomas a Becket which was in the chapel below. One of the cathedral canons joined us at this point. We went into the vestment room or sacristy. The vestiturer showed us all the old altar hangings and vestments. 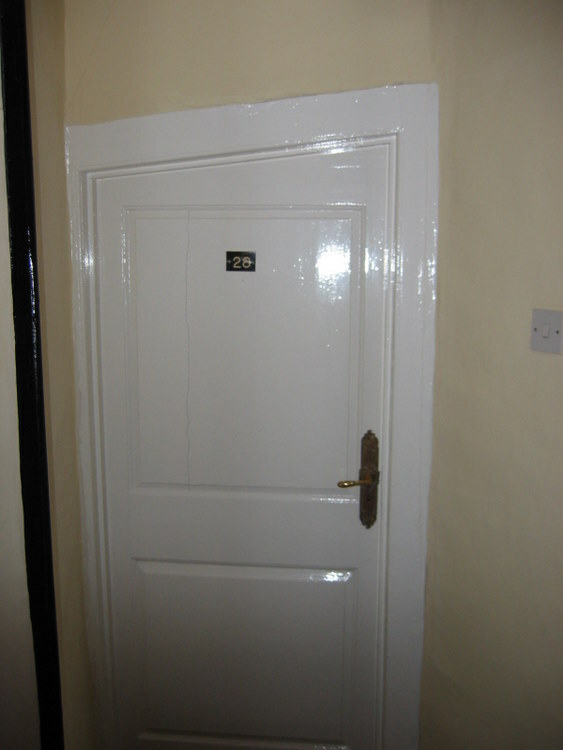 In one closet was the cope of the Archbishop of Canterbury. 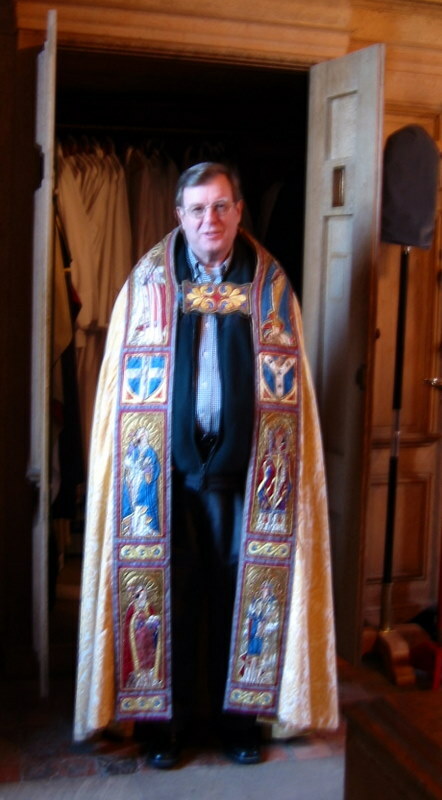 The cope is the final vestment that a bishop wears during religious ceremonies. It looks like a big cape. He had me put it on and have my picture taken. The three of our guides continued to give us our private tour of the Canterbury Cathedral. 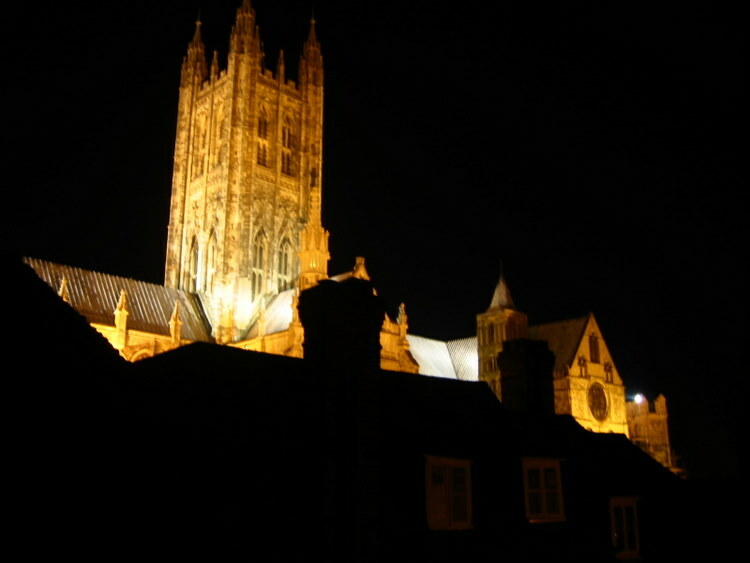 Canterbury Cathedral is about the same size as the Washington Cathedral. The profile on the left is the Washington Cathedral which is 100 feet high compared with Canterbury which is only 70 feet high. Both cathedrals, which are Gothic in style have an open triforium and stained glass windows in the clerestory. 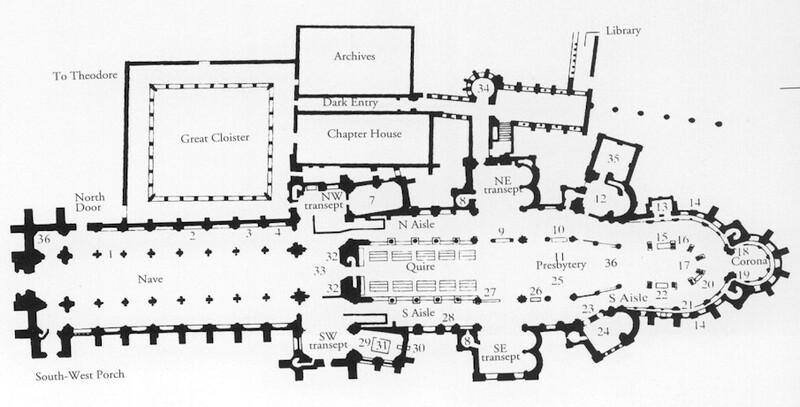 As with Westminster Abbey, there is a rood or choir (quire) screen between the nave and the choir. Even though it has a door in the center, it does not give a person standing at the entrance a clear view of the high altar. 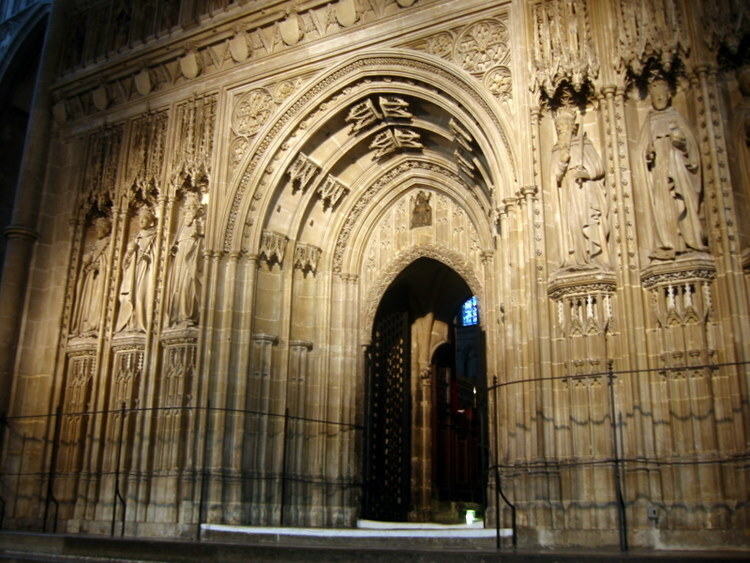 Please refer to Westminster Abbey for an explanation of Quire screen or as is sometimes called, the pulpitum. 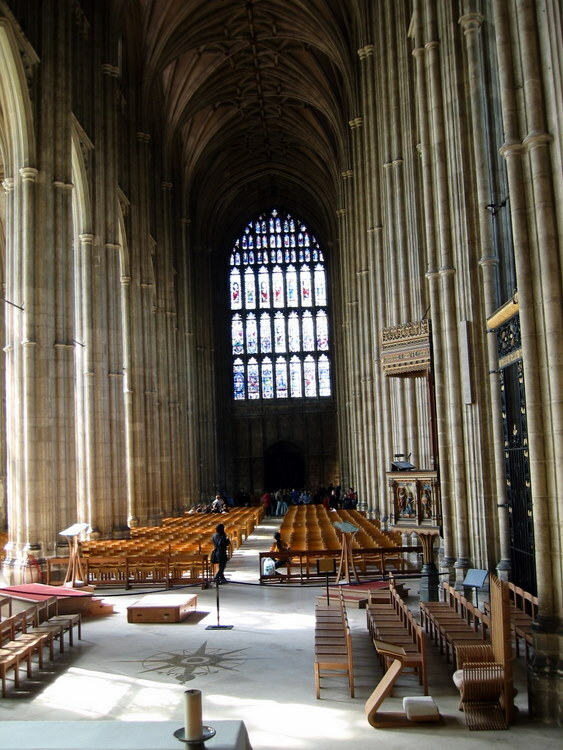 One of the reasons that Westminster Abbey and Canterbury Cathedral have not removed the Rood Screen as other Gothic Cathedrals have is because the pipes of the organ are on top of the quire screen. 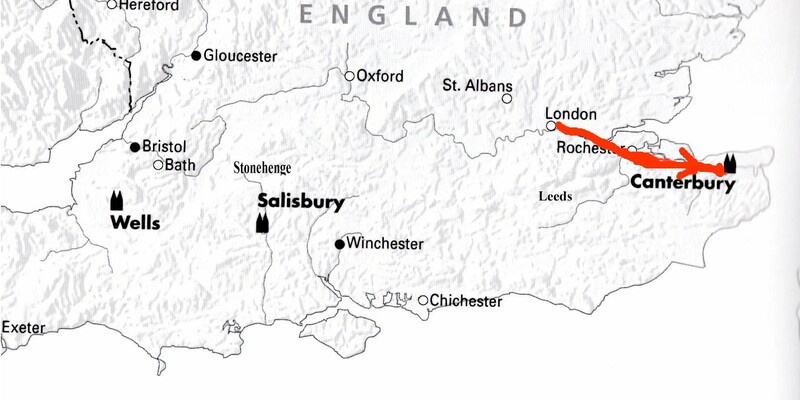 A LITTLE HISTORY OF CANTERBURY CATHEDRAL. In 597 Gregory the Great sent Augustine to England to Christianize Britain. Augustine landed in Kent where he found King Ethelbert, who was married to Bertha, a Christian. 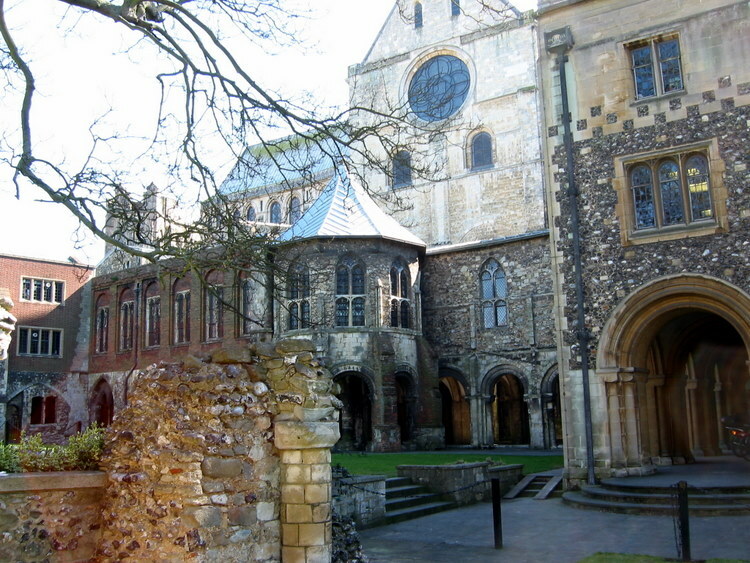 Ethelbert gave Augustine land in Canterbury for a monastery. It wasn’t long before Ethelbert and his knights were baptized. Augustine became the first Archbishop of Canterbury. e nave was demolished and new one was built in the early Perpendicular Gothic style. The Perpendicular style’s emphasis was upon height and masses of vertical line branching upward into the sprays of rib-vaulting. This was completed in 1405, taking 28 years to finish. 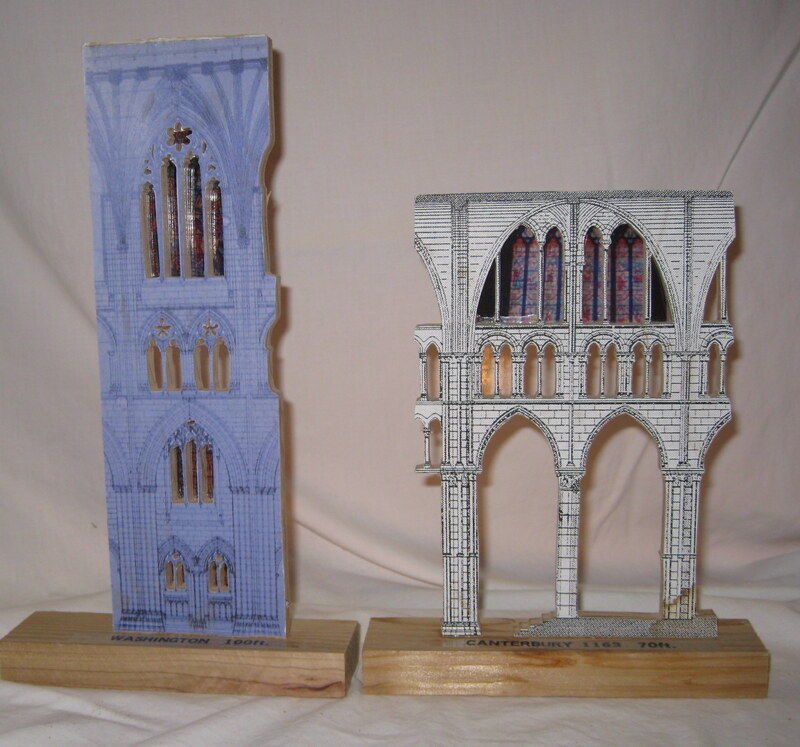 In 1414 the southwest transept for completed and the northwest transept in 1468. The Bell Harry bell tower was completed in 1494. 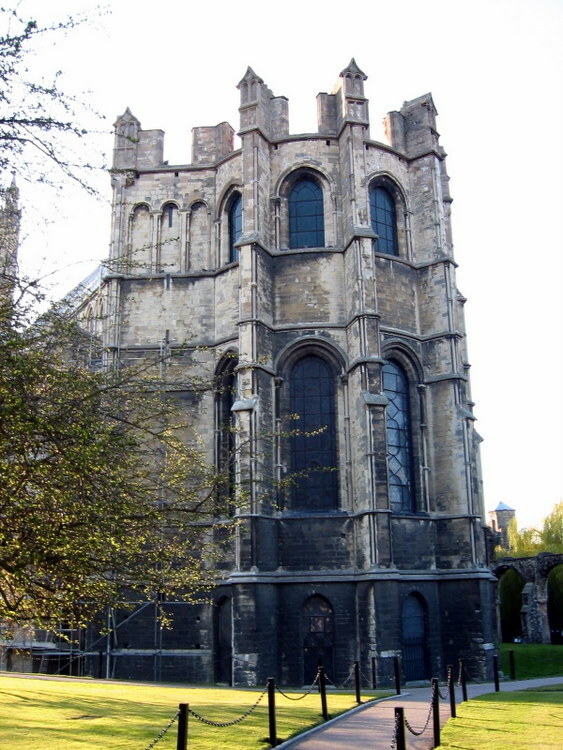 Up until the time of the English Reformation under Henry VIII in 1509, Canterbury Cathedral was under the authority of the Roman Church and the Pope. With Henry’s break from the Pope and the Church, the churches in England became part of the Anglican Church or the Church of England as they are today. The Archbishop of Canterbury remains the spiritual head of the Church of England and the world-wide Anglican Communion. photos inside except for the crypt areas where flash could damage the old paintings. 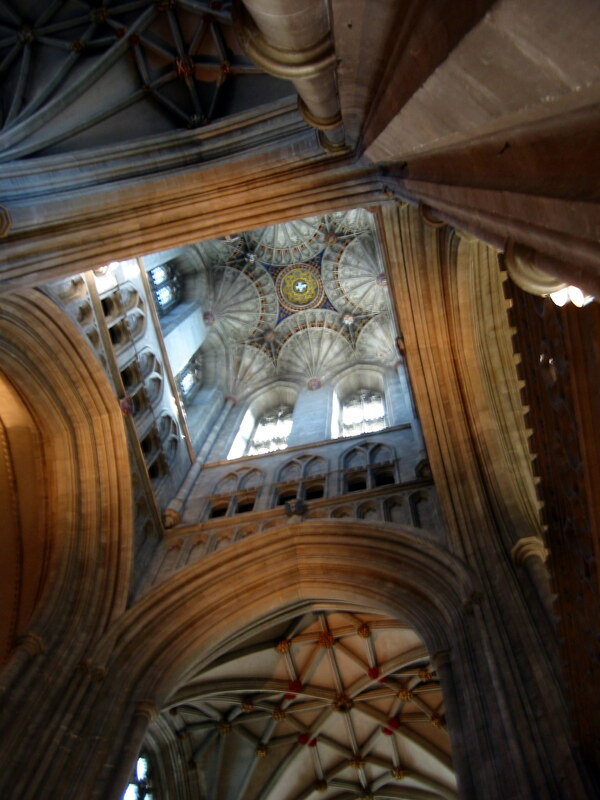 Like many Gothic churches we will visit on our quest, Canterbury had a chapel behind the high altar in the Apse. This chapel, Trinity Chapel, was located in the Apse. It was in this chapel that the shrine for Thomas Becket was placed from 1220 until its destruction in 1538. Trinity Chapel, at the eastern extremity of the Cathedral, is now dedicated to the Saints and Martyrs of Our Time. Originally it contained a relic of the part of Thomas' skull which was cut off when he was martyred. 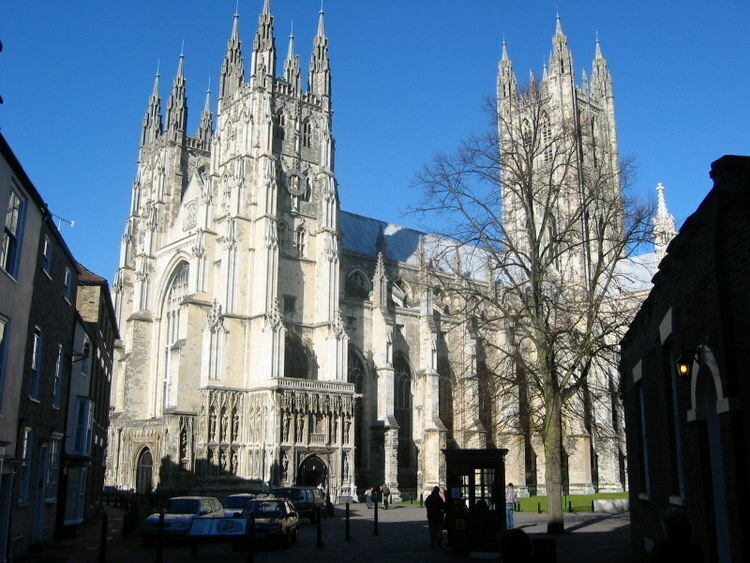 There are volumes that have been written about the history and architecture of Canterbury cathedral, from the Romanesque chapels in the crypt to the soaring perpendicular columns, the nave and choir, the exquisite stained glass windows, and the tombs and monuments to the clerical and royal champions of English history. After the tour, we did a little shopping. We were cold, and we didn’t expect England to be so cold in April. I bought a green plaid scarf. We went back to the cathedral for Evensong in the choir. The students in the cathedral schools were on spring vacation so Evensong was said. We had dinner in the tea room of the hotel.